Early interceptive care during age 4-10 years old, for quicker and less costly fixes. "I’ve been seeing Dr. Landgraf for several years and have always been treated well, both personally and professionally. The staff is friendly and helpful. 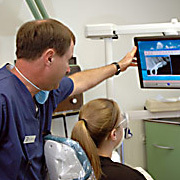 The hygienists are comfortable to be with, articulate, and instructive. Dr. Landgraf explains what I need to get done so that I can make informed decisions. I highly recommend Florissant Dental Services."